While many critiqued on how the film failed to “impress” and scare like the first instalment, I like how Jurassic World recognise the fact that T-Rex and Raptors are no longer scary and modified hybrids are needed to boost the business. Seriously, do you think ANY movie can recreate the SAME hype Jurassic Park did? Back them, dinosaurs were almost never seen in films, now, we have it over and over again. It is human nature that man tries to control and tame the animals, how many times have we seen with all the zoos and wildlife reserves. And that’s exactly what Jurassic World DID. I gotta admit, I love the concept of how dinosaurs are being tamed like animals in Jurassic World now. The film stops viewing dinosaurs as monsters but animals which human (or Chris Pratt) tries to connect with and train. The effects of the dinos were also pretty realistic and grand. I’m glad Claire’s (Bryce Dallas Howard) white clothes DID get dirty in the end, but seriously, to do the running in the forest and running away from a T-Rex in stilettos is simply crazy and impossible. Although it will be good to have some romance in the film, I guess you need it to be logical, reasonable or at least have some chemistry between the leads. Meh, I don’t like their interaction and their chemistry is NIL. I prefer Chris Pratt with his Raptors or even the beautiful Apatosaurus which died in the film. Most people will have had caught the film by the time this review is out, so now why don’t you share with me how you feel about the movie? “Indominus Rex” means “Fierce/Untamed King” in Latin, after the hybrid dinosaurs’ erratically destructive and murderous nature. The Indominus Rex is a hybrid, rumored to be part Tyrannosaurus Rex, Velociraptor, Cuttlefish, and Tree Frog. For the season two Parks and Recreation DVD (2010), Chris Pratt made a behind the scenes video. In the video he reads a fake text from Steven Spielberg about being cast in Jurassic Park 4. 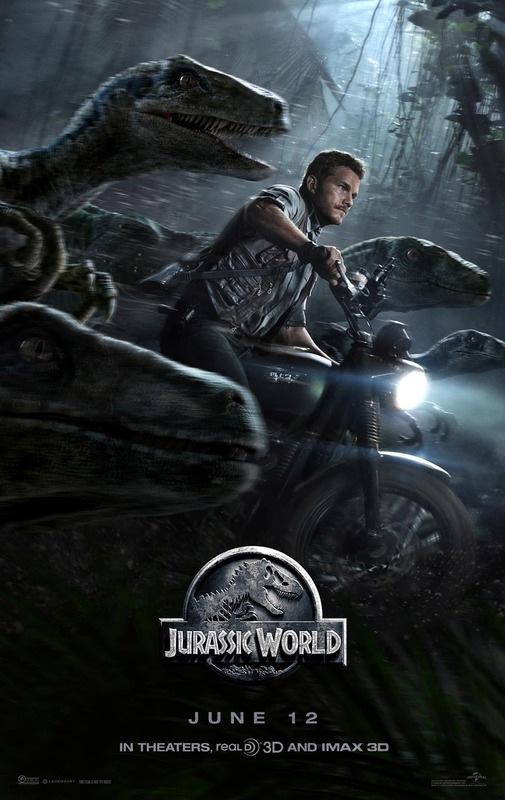 Pratt actually was cast as the lead in the 4th Jurassic Park film (2015). The gyrosphere was Steven Spielberg’s idea. According to Colin Trevorrow, then Spielberg “wanted to create a way for people to get up close and personal with the animals, to make it a self-driving, free-roaming experience. It loads on a track, but once you’re out there, you actually get to navigate around the valley”. Colin Trevorrow came up with the idea of featuring Mosasaurus, the film’s main marine reptile and wanted the Mosasaurus feed on a shark in front of bleachers filled with park guests. Spielberg loved the idea but suggested that when the animal grabs the shark that the whole bleacher section submerge underwater using a hydraulic system so that the audience will be able to see the Mosasaurus feeding underwater. The moment where the Mosasaurus soaks 200 extras sat in the bleacher section was Colin Trevorrow’s favourite moment of shooting. The Jurassic World control center set was created after doing research at Universal Studios theme park in Orlando Florida. Production designers also based some of the set on the NASA control room. Colin Trevorrow was disappointed that the control room at Universal Studios was just a few guys and some small old monitors. The T-Rex and Raptors, who are the primary enemies in “Jurassic Park, ” are now Dino-Heros in this movie. The first film in the Jurassic franchise in which the Velociraptors play a heroic role, and the first film in which the T-Rex plays a fully heroic role: not once killing a human. P.S. That’s the SAME T-Rex from Jurassic Park, it has the same scars. Bryce Dallas Howard (Claire) is seen running in high heels the entire movie. On an appearance with Chris Pratt on The Late Late Show with James Corden (2015), Howard said she did ankle exercises and “trained for running in heels as if I was in the Olympics.” Pratt then demonstrated how to run in high heels after the late night host, James Corden, surprised him with a pair of red high heels. First film in the Jurassic Park series to feature an open fully functional dinosaur theme park. In Jurassic Park (1993), the park was under construction and not yet open, and in The Lost World: Jurassic Park (1997), Jurassic Park: San Diego wasn’t entirely completed and lacked dinosaurs. Jurassic World features many Samsung products including Samsung displays in the lab, Samsung Galaxy phones, Samsung Galaxy Tab tablets, the Samsung Galaxy Gear wearable during the dinosaur hunt and the Samsung Innovation Center building. Check out Jurassic World Official Website and Facebook Page! Jurassic World is out in cinemas on 11 June 2015. We’ve seen this and we love it. The kids enjoyed it a lot and I’m sure they’d love to watch this over and over when the DVD copy is released. Running in stilettos is just crazy. I guess the first one is better but they did a great job recreating this one. I have watch it and like the story line but certain part is especially the fighting part is quite gross and dragging. Seen this movie and not quite satisfied. The Dinosaur scenes somewhat so exaggerated. And yes the actress, how come she wore high heels the entire film. OH dear. I feel really old suddenly. You were five when the first show was up?! Loved this movie and was quite fascinated with the way movie was directed.it looked superb in the theatre. It really was weird why the director chose to let the actress wear heel throughout the movie and why her clothes were always so perfectly clean! Haha! The movie is pretty awesome though! I have read some bad reviews on the movie. I watched the first one and it scared me . The idea was quite amazing them. Now, CGI is very common and because we are used to the special effects, it has become predictable. I, too, was hesitant to watch this one because I wasn’t very impressed with the original. (I can sense hail coming towards me now, haha) I haven’t seen it still but I was told it’s a good one, so perhaps I will if only to check out the running chick in stilletos, haha! I hope I will remember to buy the DVDs when it's out. From your review, it seems like a good purchase for a DVD. I obsessed on Claire’s outfit in the movie + her heels. I was waiting for the portion when her clothes were gonna get dirty and ripped. It’s really challenging to run in heels and I felt tired for her when I watch Jurassic World because she was in heels the whole time. Lol.